Tonight I tried a new dessert/cookie recipe, which I’ll share below. But first, let me tell you it incorporates a lot of good things. 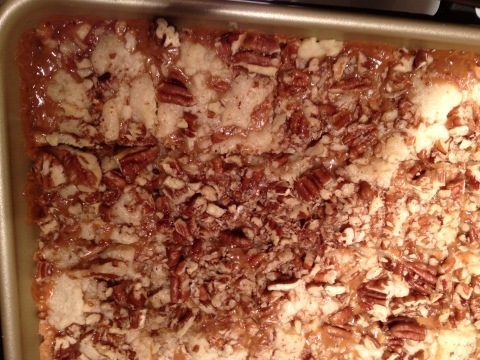 It combines butter, caramel, and (my own personal addition to the mix) chopped pecans. The dessert/cookie…haven’t decided which category it will ultimately fit in my opinion…is baked, so it has an ooey-gooey warm comfort feeling. It has a sprinkling of French sea salt over the caramel layer, so it has a hint of sophistication. You can cut this into squares, or if you want to serve as a more formal dessert, cut into wedges and add a scoop of ice cream or whipped cream on top…decadent, decadent! A few other notes: I made a half recipe, as the full version calls for a pound (a pound!) of butter, and it is my policy never to make such a large amount of a dish I haven’t tasted. Just in case, you know, that the combination of all the luscious ingredients listed is not greater than the sum of the parts. After all, it would be, at the very least, a small tragedy if I had a pound of butter baked into a dessert I really didn’t care for. So that was my choice for a first attempt with this recipe. Having made it, and now, tasted it, I can safely say that I wouldn’t hesitate to commit to the whole thing. Provided I had a good way to dispose of all but one or two pieces. Otherwise, I would be needing to invest in a new size of clothes very soon. These are that good. But I wouldn’t care, most likely, because, these are that good. So, onto the details. First, credit to the site where I found this. Check this out for a great read. So funny! And thanks for the recipe, which I discovered on Pinterest. In a large bowl, combine butter and sugars. Using mixer on medium speed, beat together until creamy. Add the vanilla and beat until combined. Sift the flour into the butter mixture and beat on low speed until a smooth soft dough forms. Bake until firm and the edges are a pale golden brown approx 20 minutes. Transfer to a wire rack and let cool about 15 minutes. Pour the caramel filling over the crust. If you choose to salt the caramel, sprinkle it over the caramel layer now. My addition: Top with a cup of chopped pecans. Other ideas: I’m thinking of sprinkling mini semi-sweet chocolate chips over the top the next time I bake this. Don’t overbake! The cookies cut beautifully after they cooled. Last, if you’re looking for a great shortbread recipe, this one is as good as any I’ve tried. I have never made shortbread with two kinds of sugar, but the dough was easy to work with and baked beautifully. It could stand alone as a wonderful shortbread if you want something a little less sweet, or a bit more simple. I think a button just popped off my jeans! those look fantastic. 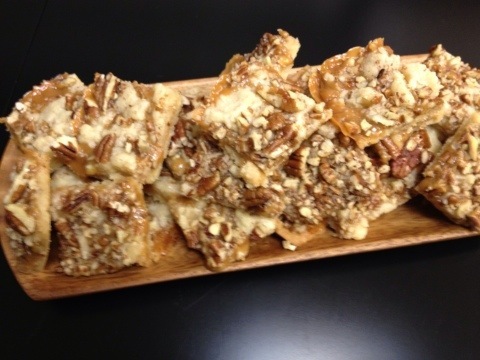 How can you go wrong with caramel AND pecans? They really are amazing! Hope you enjoy! Did you pin it on pinterest? Thanks for sharing pinterest with me in your blog last month, I love it and I think this recipe would be a hit! will definitely try these soon…sounds yummy!